Zinedine Zidane is one of the most famous French football players of all time, widely regarded as a master of the fundamentals and techniques of the game. He is known for his excellent control and dribbling skills, his magic ball touch, his focused vision and great leadership traits. During his active soccer years, no player would surpass the way he controlled and received the ball. He scored 31 goals, out of his 108 international outings. Since his retirement, Zidane has actively participated in his beloved game as a manager. In his active years, he was celebrated as the top notch player for France. His excellence in football has bestowed Zidane some coveted awards and awards such as the FIFA World Player of the Year thrice, and the Ballon D'Or once. 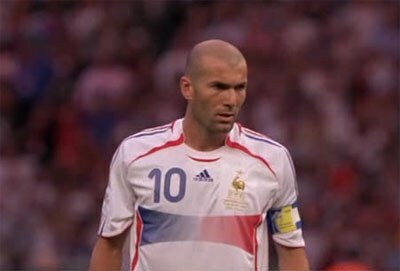 Zinedine Zidane representing France in 2006 World Cup. Zinedine Zidane was born in Marseille, France, on June 23, 1972. At the tender age of five, young Zidane was introduced to the football game. Together with his neighborhood friends, he played football, at the main square of the housing complex known as, the Place Tartane. In his early days, his love for football was mainly influenced by Olympique Marseille players; Jean-Pierre Papin, Enzo Francescoli and Blaz Sliskovic who were his soccer stars idols. At the age of ten, Zidane bagged his first player license for the junior team of a local club from La Castellane. He perfected his skills on the rough streets of La Castellane in Marseille, France. However, his term at the club was short lived and after about one and a half years he was transferred to SO Septemes-les-Vallons. His alliance with Septemes, however, lasted for about two and a-half-years, after which he among those selected for a three day training in Aix-en-Province at the CREPS. While training at CREPS, his skills were ascertained by AS Cannes recruiter, Jean Varraud, at a French Football Federation training camp. He was taken in where he spent his next three years, perfecting his skills in the Cannes' Youth division. After his training in the Cannes' Youth division, Zinedine Zidane, pursued football as a professional career. He made his first professional appearance at Cannes, at the age of 17, scoring his first goal. In 1992, he was transferred to the Bordeaux as a midfielder. Here, he proved his sterling all-around soccer skills that propelled his popularity. However, he was prone to occasional episodes of temper. Nonetheless, he was the real embodiment of control, he knew how to work his way with the ball at his feet, how to maneuver through the defense, how to pass the ball to a teammate and how to rocket a shot at the goal. In 1996, Zidane was later transferred to Italy's Juventus FC This transfer heightened his visibility and expectations in the pitch. In the next two seasons, he steered Juventus FC to an Italian Super Cup, a UEFA Super Cup, an Intercontinental Cup and a pair of Series A. The peak of his career was in 1998 when France held the World Cup. Zidane steered Les Bleus through the tournament, where his dribbling and crisp passing skills scored two goals for France against Brazil in the finals. He became a national hero, by shutting down Brazil in the 3-0 win World Cup finals. In 2000, he once again spearheaded, the French's team to international glory at the European Championship where culminated a 2-1 win against Italy. One year later, in 2001, Zidane was signed up by the Spanish Club, Real Madrid, for a world-record transfer fee of more than $66 million. This investment proved very fruitful, with Zidane, helping Real Madrid win the coveted UEFA Champions League title in his first year after he was signed up. The next season was also very successful, with his prowess skills helping Real Madrid win the La Liga. In 2006, Zidane declared that he would retire soon after the 2006 World Cup held in Germany. However, at a turn of events, his career came to a premature end in the finals when France advanced to the finals with Italy. His career ended fashionably, when one of the opponents, Marco Materazzi enraged him with his comments (which according to Materazzi were "stupid words" about the opponent's sister), in the allocated extra time. In return he slammed his head against the Italian's opponent's chest, leading to his automatic disqualification. Subsequently, France loosed to Italy on penalty kicks. Zinedine Zidane has created a legacy of his own in soccer with his many achievements and accolades. In 2004, he was named the best European soccer player of the past 50 years by the UEFA Golden Jubilee Poll. This, subsequently, led to his name being included in the FIFA 100, Pele's List of the 125 greatest living soccer players of all time. He also won the French Player of the Year Awards twice in the years, 1998 and 2002. Additionally, he is also one of the very few soccer players to win the FIFA World Player of the Year/ Ballon d' Or Awards three times. In March 2001, Zidane was appointed as the United Nations Goodwill Ambassador. With this title, he annually, captains a team of soccer stars against a side led by fellow retired soccer idol and United Nations Ambassador, Ronaldo, in a charity match. In 2010, Zidane served as a high-profile ambassador for Qatar's successful bid to host the 2022 World Cup. In 2011, Zidane joined Real Madrid's front office as a chief adviser and was also named as the club's sporting director. Subsequently, in 2012, it was announced, that the French retired soccer legend, would start coaching at the Real Madrid Youth Academy. This was the first step towards a new career of calling the shots from the sidelines of his favorite game. In 2016, it was declared that Zidane would be the new coach of Real Madrid.